East Hamilton's Madison Hayes, right, tries to shoot while being defended by Bradley Central's Anna Walker (42) during their District 5-3A basketball game Tuesday night. Hayes was in constant foul trouble, picking up three in the first quarter, and played just 13-plus minutes and scored 11 points in a 75-38 loss. CLEVELAND, Tenn. – Madison Hayes, one of the most highly recruited girls’ prospects in the Chattanooga area, came into Tuesday’s District 5-3A game against Bradley Central in Jim Smiddy Arena in an up-beat state of mind. Hayes, who joined the East Hamilton varsity as an eighth-grader, was recognized on Friday for scoring 2,000 points and grabbing 1,000 rebounds for the Lady Hurricanes. Earlier Tuesday, Hayes was informed she had been nominated for the Gatorade Player of the Year in Tennessee. Hayes and her teammates were hopeful of ending an 0-15 losing streak against Bradley. They had played the Bearettes to within nine points on Dec. 14. Hayes’ mental high didn’t last long once the Lady Canes and Bearettes tipped off. 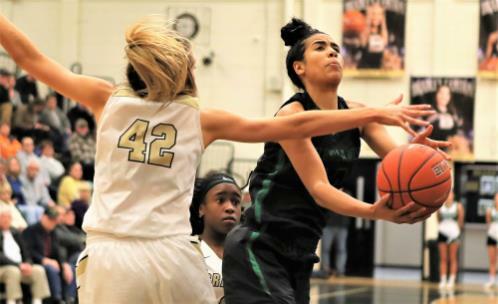 A 6-foot-1 junior picked up three fouls in the first quarter and finished with 11 points, 14 below her season average and played just under 14 minutes in East Hamilton’s 75-38 loss to the state-ranked Bearettes (20-3, 8-0). East Hamilton (14-10, 5-4)was whistled for nine fouls in the first period and Hayes had three, the third coming with 5:27 left in the period. She spent several minutes on the bench before returning to the action early in the second quarter. Hayes was hit with a fourth foul in the second period and scored four points in the first half. 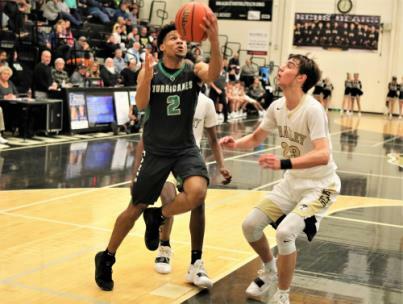 In the boys’ game, East Hamilton held on to beat Bradley Central, 65-60, and retained sole possession of first play in the district standings. The Hurricanes (16-5, 8-1) have a half-game lead over Cleveland (18-4, 6-2) and the Blue Raiders, who have won 11 straight games, are idle until Saturday when they host Gate City, Virginia. With Hayes in foul trouble, the Bearettes, who registered third 62nd consecutive win against a district opponent, went to work inside where Anna Walker produced 19 points and nine rebounds and Alexis Barnes added 13 points and Amelia Reuter dazzled from long distance with three 3s and 11 points. Amelia Reuter, who had made just five 3s in her previous 21 games this season, came up with three in a two-plus minute spree when the Bearettes stretched a 10-5 first-quarter lead to 24-9 in the second. Amelia Reuter’s contribution – she played 15 minutes – showed the depth advantage Bradley had over the Lady Canes. Bradley outscored East Hamilton’s thin bench, 34-6. Couple that with Walker and Barnes producing most of their combined 32 points down low, the Bearettes hammed the visitors, 40-16, in the paint. When the game ended, Madison Hayes, who also is a Tennessee Sports Writers Association All-State volleyball selection, and Eliziah Laboo each fouled out. Mya Patton had four fouls and Emily Petitt three. East Hamilton was called for 21 fouls -- 16 in the first half -- and the Bearettes made 16 of 24 free throws. Officials called 17 fouls on Bradley and the Lady Canes hit 13 of 20 charity tosses. Anna Roberts, Walker and Hannah Lombard each had four fouls and Kaleigh Hughes three. “Was it a difference Madison Hayes was sitting out some of the first half, absolutely,” said Reuter, who has coached all 15 wins against East Hamilton. “Officiating is part of the game. You’re rolling the dice when you’re playing your star with three fouls, but I’m sure Hunter – he’s a good coach – probably told her not to even tough anybody. Gremore’s technical came immediately after Hayes fouled out with 1:36 left in the third period. The Bearettes scored six of the final points in the period and took a 50-32 lead into the fourth. Bradley’s led 54-38 and scored the game’s final 21 points over the last 4 minutes and 53 seconds. East Hamilton boys 63, Bradley Central 60: The Hurricanes got 53 of their 63 points from the trio of Morrell Schramm (22), Jamaal Walker (18) and Cam Montgomery (13). East Hamilton needed every bit of that offensive punch to get the win. The Canes were up 39-30 at halftime and Walker made a layup to star the third period. The Bears (13-7, 4-4) scored the next 11 points and the streak included Quante Berry’s 3 and Tray Curry’s dunk. Trailing by 48-45 after three quarters, Curry made a layup and his second dunk and Bradley grabbed a 49-48 lead starting the fourth period. Walker nailed a 3, a baseline jumper and dropped in a put-back as East Hamilton went back out front, 55-51. The East Hamilton bench was assessed a technical. Mason Rothwell hit two free throws and on the ensuing possession Tyler Ferguson added one and the Bears trailed 55-54. Schramm converted a three-point play with 1:48 left. Ferguson answered with a layup. Curry made a free throw at the 22.2-second mark. Darwin Randolph made 1 of 2 charity tosses a second after Curry’s. Walker was fouled and made both free throws for a 61-57 lead with 10.6 seconds on the clock. Bradley’s Saylor Clark knocked down a 3 from the left wing. The Bears called a timeout, but when they didn’t have one to take. Officials called a technical. Walker made two free throws and Montgomery added two more with 0:02 left. East Hamilton made 8 of 10 at the line down the stretch and Schramm’s bucket was the team’s last field goal over the final 1 minute, 48 seconds. East Hamilton (38) – Patton 3, Lacy 9, Madison Hayes 11, Petitt 3, Laboo 6, Mc. Hayes 6, Evans, Johnson, Sue. Bradley Central (75) – Hughes 5, Roberts 5, Blair 7, Anna Walker 19, Lombard 5, Mayo, Alexis Barnes 13, Amelia Reuter 11, Williams 6, Carman, Estrada 4, Hullender, Crittenden, Falcon. 3-Point Goals – East Hamilton 3 (Mc. Hayes 2, Lacy 1), Bradley Central 5 (Reuter 3, Lombard 1, Hughes 1). East Hamilton (63) – Jamaal Walker 18, Cam Montgomery 13, Morrell Schramm 22, Rogers, Marcus Long 7, D. Randolph 3. Bradley Central (60) – Boyd, Clark 7, Tray Curry 17, Tyler Ferguson 13, Mason Rothwell 14, Greene, McCleary, Berry 9. 3-Point Goals – East Hamilton 7 (Walker 2, Montgomery 2, Schramm 2, Long 1), Bradley Central 3 (Curry 1, Clark 1, Berry 1). East Hamilton's Cam Montgomery (2) drives on Bradley Central's Mason Rothwell (23) Tuesday night in a District 5-3A basketball game at Jim Smiddy Arena. The Hurricanes won, 63-60, to retain first place in the league standings.